Will Australia Enact Carbon Taxes? Aussie Labor Party Prime Minister Julia Gillard is waging an aggressive PR campaign to sell carbon taxes in the Land Down Under. Resistance is fierce, with opposition leaders saying the tax “is so toxic that Labor MPs could dump her to save their own seats” (The Australian, June 3, 2011). In June 2010, Labor ousted Ms. Gillard’s predecessor, Kevin Rudd, not long after the Australian Parliament, in April, rejected Rudd’s Carbon Pollution Reduction Scheme (CRPS), a greenhouse cap-and-trade program. In August 2010, Guillard barely survived an election that produced “Australia’s first hung parliament in recent decades” (Reuters, Sept. 7, 2010). The current Labor-Green-Independent coalition has a one-vote majority in the Australian House of Representatives. In a campaign speech on climate policy shortly before the 2010 election, Gillard claimed to have learned the “lessons” of CRPS’s defeat. According to her, the government moved too fast because the “consensus” for cap-and-trade was not a “community consensus.” So Gillard pledged that if she won the election, Labor would establish a “Citizens’ Assembly” — a 12-month “process” whereby government experts would engage the community and make the case for urgent action on climate change. And what if this re-education program failed to work? As President Obama might say, Ms. Gillard noted there were other ways of skinning the cat. “I [will not] hold back actions that could move us forward from today to create a cleaner, more efficient future,” she declared. Gillard mentioned several options such as policy privileges for renewable energy, jaw boning big emitters, and voluntary emission reduction credits applicable to a future cap-and-trade program. She did not, however, mention the policy she’s pushing now: carbon taxes. Under her proposal, about 1,000 of Australia’s largest emitters would pay a $26/ton carbon tax. The tax would take effect in July 2012 and morph into a cap-and-trade program three to five years later. Opposition Leader Tony Abbott has been criss-crossing the country warning of enormous job and GDP losses (Courier Mail, June 4, 2011). Opinion polls indicate that 60% of voters oppose the tax compared to 30% in favor (Reuters, June 2). 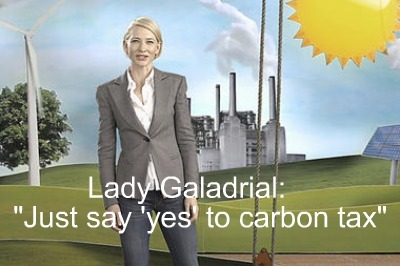 Actress Cate Blanchett made a “just say yes, to the carbon tax” television ad. Some 140 celebrities signed a petition supporting the tax as part of a $1 million advertising campaign (Climatewire, May 31). Politicians in Washington will thus be watching closely how the battle over carbon taxes plays out in Australia. Dems in particular will be more likely to push for carbon taxes here if Gillard can pull it off. Listen to what every one is telling you. The sky is falling. The Cost of Political Pseudo-Science Shown In Two Examples.